The Charl du Plessis Trio is one of the most versatile and respected crossover ensembles from South Africa. The diverse style of music this trio performs ranges from Baroque, Latin, Swing, Classical to Funk and sets them apart from other instrumental groups. The trio consists of Steinway Artist Charl du Plessis (piano), Werner Spies (bass) and Peter Auret (drums). The Charl du Plessis Trio was founded in 2006 with drummer Hugo Radyn and bassist Werner Spies to further the enjoyment of jazz music and prove that classic music lovers can enjoy jazz too. This unit recorded their first album TRIO in 2007 with jazz standards and compositions by Du Plessis. Since their first national tours this trio has become South Africa’s most wanted cross-over performers on radio, television and stage with country-wide tours each season. In 2009 the first international tour followed with sold-out performances in China, Switzerland and the Netherlands. 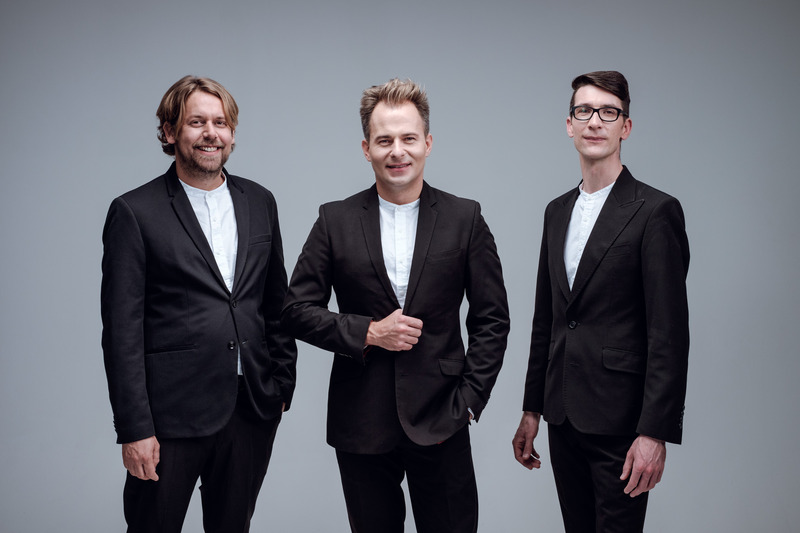 Since 2009 the trio has returned to China and Switzerland annually and is active as performers, teachers and clinicians in master classes and workshops. The SHANGHAI BRUNCH album was released in 2011 and won Best Instrumental Album prize at the KykNet Ghoema awards and was nominated for a SAMA award. This disc featuring cross-over arrangements of classical music in a jazz style received rave reviews and has become one of the trio’s best-selling recordings. The trio was awarded the trophee for Best New Production at the Vryfees National Arts Festival in 2010 and 2013. They regularly perform with South African singer/entertainer Nataniël and has recorded two albums and two live DVD with this iconic artist. In 2013 the Charl du Plessis trio was invited to perform at the Standard Bank Joy of Jazz Festival in Johannesburg alongside some of the biggest names in international jazz: Ahmad Jamal, Abdullah Ibrahim, Terence Blanchard and Tia Fuller. Charl du Plessis released his first LIVE CD and DVD box set PIMP MY PIANO in 2013 featuring live recordings made in the Sand du Plessis Opera House in Bloemfontein, South Africa. This production won a SAMA Award for Best Engineer: Peter Auret. Charl du Plessis is a Steinway Artist and one of the most respected pianists in South Africa performing across various styles and diciplines and as soloist with some of the country’s leading syphony orchestras. Werner Spies is a multi-talented bass player and teacher. Peter Auret is sought after jazz drummer and a SAMA award-winning recording engineer and producer, and the owner of Sumo Sound recording studios in Johannesburg. In July 2013 the Charl du Plessis trio recorded their fourth album Baroqueswing in Ernen, Switzerland. The Trio just released their fourth disc featuring the vocal talents of Musanete entitled Gershwin Songbook. Baroqueswing Vol. 2 was released in October 2016 as part of the Charl du Plessis Trio’s first European recording deal with Swiss record label Claves and features new interpretations and arrangements of Baroque favourites by Bach, Handel and Vivaldi. This disc won a SAMA Award in May 2017 for Best Classical/Instrumental Album. The first LIVE DVD recording and documentary film entitled Baroqueswing Vol. III was released in January 2018 and was awarded a SAMA Award for Best Classical/Instrumental Album in June 2018. Claves.